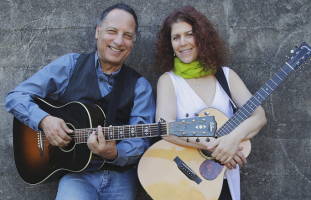 An interactive mini-concert for the whole family by Bob Reid and Judi Jaeger, with participatory singing and storytelling. Prepare to be moved. Appropriate for all ages. Bob Reid presented thousands of workshops and performances for children over the past 40 years. He was California Arts Council Artist in Residence, performed at the United Nations, hosted a weekly children’s television program and recorded 3 albums of songs for children. Pete Seeger said, “There isn’t a group of children anywhere in the world that can resist Bob Reid! He’ll get them singing, he’ll get them writing songs, he’ll get them dancing and they will all be asking, ‘When’s that man coming back?’”. Bob will be joined by his Jaeger & Reid singing partner, Judi Jaeger, on vocals and ukulele. Audiences on the east and west coasts have been captivated by their honest, intelligent original songs, the delicate interplay of their voices and guitars and the stunning harmonies which brought them together.